If you think to eat killer pastrami you need to visit a landmark deli in Manhattan, you haven’t been to Fette Sau BBQ in Brooklyn. Or The Granary in San Antonio. Or The Local Pig in Kansas City. America is experiencing a pastrami renaissance with soulfully cured, assertively spiced smoked meat turning up at top barbecue joints across the country. Darkly crusted with crushed coriander seed and fiery with black pepper. Meat so moist it squirts when you cut into it and so flavorful, you don’t really need mustard, pickles, or rye bread. And if you think the pastrami sun rises and sets on beef belly, well, check out the “porkstrami” at Tails & Trotters, a pork-centric butcher and deli in Portland, Oregon, or the lamb pastrami at Wente Vineyards in California. And while you’re at it, dig your fork into New York chef David Burke’s salmon pastrami or the electrifying kung pao pastrami stir-fry at Mission Chinese in San Francisco. The truth is, pastrami is less a single dish than a process. I wouldn’t be surprised if someone, somewhere, is about to apply it to tofu. But I get ahead of myself, because I really wanted to begin this story not in New York or even the United States, but at the Spice Bazaar in Istanbul. It was here, on my Barbecue! Bible research tour, that I came across arm-long strips of meat caked with orange aromatic spices hanging unrefrigerated from shop rafters. I had eaten versions of this cured meat—usually beef, once camel—throughout the Middle and Near East, where it goes by the name of basturma (sometimes written pasturma). It was cured and dried, not smoked, and the spicing differed dramatically from the pepper-coriander rub on American pastrami. But the two—etymologically and gastronomically—shared a common ancestor. Wikipedia hypothesizes that basturma originated with an Anatolian air-dried beef made since Byzantine times. Today, that beef would be salted, air-dried, pressed, then salved with a pungent paste of garlic, cumin, fenugreek, and hot paprika. This makes it food-safe for extended periods at room temperature and salty and spicy enough to enjoy sliced as an aperitif with raki (Turkish anise liqueur), scrambled with eggs, and even crisped over a charcoal grill. Beef is the preferred meat today, but you also find basturma made with lamb, goat, water buffalo, and the aforementioned camel. So how did Ottoman basturma become Jewish pastrami and how did it migrate from Istanbul to New York’s Lower East Side? And why has a new generation of American pit masters embraced this classic deli meat with such gusto? The most likely transfer agents were Jewish immigrants from Romania who brought pastrami to New York in the 1870s. In the Old Country they made it with the budget meat of the period—goose. Even cheaper in the New World was beef navel (a fatty cut from the steer’s underbelly), which became the meat of choice for pastrami. Somewhere along the line, the name acquired an “i” at the end—perhaps to rhyme with another popular immigrant food of the period—salami. Traditional deli pastrami involves a four-step process that includes brining (like corned beef), a rub (like Texas barbecue), and smoking (but less heavily than Southern or Texas barbecue). The fourth step is steaming, which further softens the meat and keeps it warm and moist throughout the day for serving. Modern barbecue joints achieve a similar texture by wrapping the pastrami in butcher paper or foil after smoking and resting it in an insulated cooler. So how easy is it to make pastrami at home? If you can smoke a brisket, you can cook a pastrami. It requires more time and patience than culinary skills. In my next blog post, I’ll tell you what you need to know. 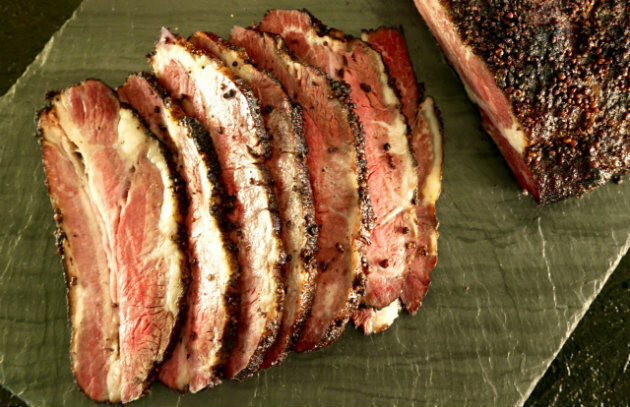 Get the recipe for Home-Smoked Pastrami. Read Home-Smoked Pastrami, Part 2.